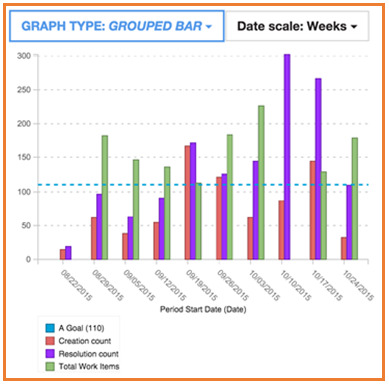 Your wait is over for improved CLM project reporting. If your team hasn’t started using reports from the new Jazz Reporting Service (JRS) then you are really missing out on some of the best new capabilities that have been provided to the IBM Collaborative Lifecycle Management tools (IBM Rational Team Concert, Rational Quality Manager, and IBM DOORS Next Generation). In December 2015, IBM released version 6.0.1 of CLM, which now includes the Jazz Reporting Service as part of the installation package. It makes it easier for your system administrator to include it as one of the Jazz Team Server services. In this release, one of the hallmark features now provided in JRS is the ability to report on historical trends and show how a set of metrics has changed over time. This means that you can look at the increase, stability, or decrease in a set of attributes for your artifacts and work items, and see if any actions need to be taken to keep your project team on track. This means reports like compliance trends, severity and anomaly backlog changes over time, rates of arrivals and closures, plan versus actuals, and many, many more are available to meet the needs of your projects. 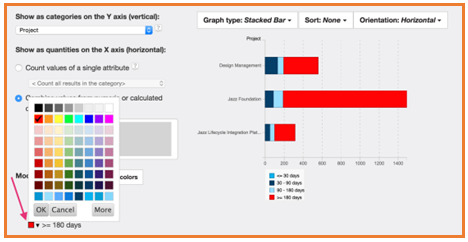 Jazz Reporting Service 6.0 introduced a number of out-of-the-box reports based on story point, hours and open work items, but with this new historic trend ability, you can also customize them to fit your own needs. They can have goal lines and additional trend overlays to improve the richness of how they measure the project. If you would rather look at the aging of a set of work items at a single point in time, then that report can also be created to show how a single snapshot of work items are reflected in categories or periods of time. Then, like all reports from JRS, these can be added to personal or team dashboards for direct viewing along with the live CLM project data. It is also worth noting that JRS reports will not conflict with existing RTC or RQM Birt reports so if you already have some of them in place, these new reports can be added without impacting the project team’s dependency on pre-existing/mandatory reports. Beyond the historic trend reporting, JRS 6.0.1 now included its first supported version of the Lifecycle Query Engine (LQE), which supports two key concepts. The first is a more live method of building reports for your project based on a reporting index rather than a data warehouse. LQE doesn’t replace the existing data warehouse, which is supported by the reporting service’s Data Collection Component. The data warehouse will certainly still be there for organizations that prefer using that method, but the LQE is an additional complementary capability that will build the reports on demand using the server’s index. The second concept provided by LQE is the ability so support CLM projects that are using the Opt In for Configuration Management. So when you’re ready to deploy CLM projects in different configurations, you’ll now be able to distinguish which configuration should be included into which report. And again, because JRS is using an indexed method, you’ll be able to rely on current results in order to support any business analysis or development decision. JRS also has been further updated to support some of the latest web design principles and layout from the IBM Bluemix environment. So for those of you who are already using JRS or have followed the development progress, you’ll see even more improvements to the overall look and feel and the latest usability updates from our Design Thinking program. Finally, although it seems small and almost not worth mentioning, the following seems to get the biggest item of note for those who have been following our development progress. Practitioners now have the ability to change the color of graphical reports to colors of their choosing. This will allow you to show your critical work items in Red, your mandatory items in Yellow, and the nice-to-haves in… well, whatever color your team decides! We invite you and your team to take advantage of the Jazz Reporting Service and increase your ability to make business decisions based on real quantitative reports instead of gut feel or tribal knowledge. Jazz Reporting Service 6.0.1 can be found bundled in the latest CLM 6.0.1 installer, and it does not require any additional license beyond your existing CLM license for RTC, RQM or DOORS NG. See JRS 6.0.1 New and Noteworthy for more specific details about each individual features and the CLM system requirements for server specifications.